The dry urine diverting toilets (UDD) serve as an example how to improve the sanitary and hygienic conditions in a sustainable manner in particular for the children and how to protect soil and groundwater against infiltration of human excreta. 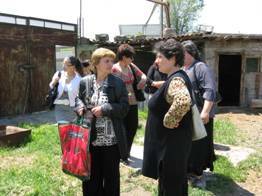 Armenia has only a very limited budget for operation and maintenance of public facilities, including schools. Almost in all rural schools the schoolchildren have to use outdoor pit-latrines. These are located in a corner of a school yard. These latrines are in a very poor state, they smell and are dirty and no privacy is guarantied for the users. The doors of the toilets either do not lock or they are missing at all. Another danger during freezing temperatures is slippery floors in the latrine. In many schools there are no hand washing facilities or in some cases even no water is available for washing or drinking purposes. This is also the case in Hayanist, Fantan and Khachpar where AWHHE has implemented joint projects with WECF on construc tion of UDD toilet facilities in 3 village schools (Hayanist, Fantan, Khachpar) and for 28 households in 2 villages (Hayanist and Dzoraghbyur) since 2005. As a result of that activity at present the pupils and school staff use comfortable, warm, clean and odour-free toilets. Hayanist is situated in a basin-shaped and swampy area with a high groundwater table (0,8 – 1,5m depth). There are 2440 inhabitants in the village. A large majority of the households have pit-latrines that in general are unsealed. Due to the high groundwater level, the depth of the pits is about one meter. Very often the pit latrines are constructed on open drainages. The water from these drains is used for irrigation of fields and house yards. There is no quality control over drainage water. All these bring about high risk of soil and groundwater contamination. There exists another problem connected with pit-latrines. Very often after the pit-latrine gets full the villagers cover it and dig another one somewhere in the yard or in the garden. Wastewaters from such pit-latrines can infiltrate into the groundwater and contaminate it. There are 2700 inhabitants in the village. The situation regarding sanitation is the same as in Hayanist. The village has shallow pit-latrines and high ground water table about 3m deep. To organize 2 – day training with involvement of the international expert for capacity building of the AWHHE, villagers and the interested national NGOs in the field of WATSAN on ecological sanitation toilet construction, possible constraints and solutions. Project was implemented in 2009. During the project implementation AWHHE organized 5 meetings with environmental NGOs, dealing with water and sanitation issue. 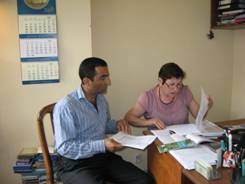 Preparation of information materials: AWHHE investigated the appropriate information, adopted it in to easy understand, translated it into Armenian, printed and disseminated. These information materials give an overview on general concept of sustainable sanitation; dry urine diverting toilets; detailed design of the out door toilet for the rural private house; construction of the out door toilet with a wall urinal and a urine diverting seat. Information Dissemination: The main purpose of dissemination of information at this step was to enhance awareness about sustainable sanitation, safety of drinking water and alternative agricultural approaches among the villagers and stimulate an interest to innovative mentality. 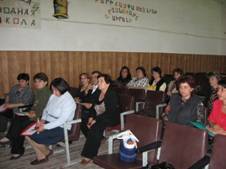 AWHHE conducted 4 local trainings for local authorities and villagers on drinking water issues and sustainable sanitation (construction and usage). In frame of this project AWHHE organized 2 – day training for introducing UDD technologies. The aim of the training was to contribute to the capacity building of the AWHHE, villagers and the interested national NGOs in the field of WATSAN on ecological sanitation toilet construction, to consider the constraints and suggest the possible solutions . The training was conducted on 14-15 th of May, 2009. The participants of the training were 46 people: 2 people from USA Peace Corpus who implements ecological toilets in Armenia; representatives of 7 national and local non governmental organizations (NGOs) from Ararat, Araga ts otn and Lori marzes/regions who would later spread information on UD toilets or implement them ; 1 journalist from the same district; 8 employees of AWHHE and 36 villagers from Hayanist and Khachpar who have constructed or are going to construct UD toilets. The training was conduct ed by Jan-Olof Dragnert, the international expert. According to the request of AWHHE he introduced topics such as: “Ecosan: Closing the Loop”, “Hygienization of excreta and WHO Guidelines”, “Treatment of excreta”, “Urine and faeces as fertilizers” and “Ecosan in practice- technical issues”. 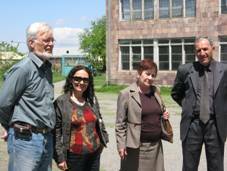 On the second day were organized f ield visits for participants. 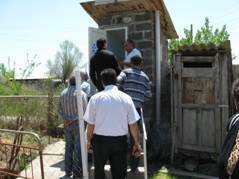 Participants visited 2 school toilets in Khachpar and Hayanist, 3 household toilets and the composting site in Hayanist. Hayanist: The toilet facility with male and female restrooms, totally with 7 double vault urine diverting toilets and 3 urinals has operated since October, 2006. Khachpar: The school building with 6 urine diverting toilets and 3 waterless urinals for 250 pupils and 23 teach ers was constructed in September, 2008. The training gave additional information to practical solutions to the problems. Education materials, leaflets and posters on the use and maintenance of the toilets were distributed among participants. People were very interested in the new concept and many of them expressed their wish to have such a toilet. The discussion s went very active. 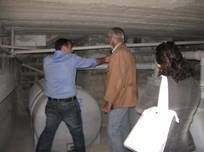 Jan-Olof Dragnert visited the existing household- and school UDD toilets, examined the piping system for urine tanks, washing basins, chambers of feaces and ventilation. The expert mentioned the positive changes that had taken place in construction from the first toilet in Hayanist to the toilet in Khachpar. 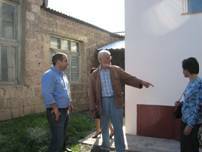 Jan-Olof Dragnert expressed his satisfaction with the quality of the construction and the maintenance of the toilets. Article: The article entitled “The problem should have a solution” was published in the local newspaper “Ararat”, where the activities of AWHHE NGO on sustainable sanitation were highlighted. 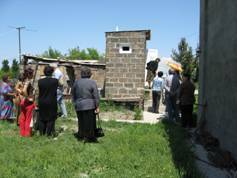 Contribution to the capacity of 7 NGOs from 3 marzes, 1 international organization, 36 villagers from 2 villages and 8 employees of AWHHE has been done for further implementation of UDD toilets in Armenia . Villagers and NGOs became more knowledgeable ; they were trained and instructed about construction, operation and maintenance of UDD toilets. As a result of this activity sustainable sanitation concept has been promoted and disseminated. Field visits to the existing UDD toilets (2 school- and 3 household toilets) and the composting site were organized. The toilets were examined and evaluated by the expert from the Linköping University . The participation of the expert in the training and evaluation of the toilets is an important contribution to the development of innovative mentality on local level. The interest of people in sustainable sanitation is increased and in follow-up projects more UDD toilets will be constructed for households and other schools. O ne of the employees of the marz administration visited AWHHE’s office for having a consultation on construction of the UDD toilets. He learnt about UDD toilets from his colleagues from the NGO “Eco Tour” participated in the training. AWHHE has encouraged wider participation of the rural women in the training and consequently, in the process of sustainable rural development by active participation in social and political life on the local level where women have predominance such as education, health, culture and social welfare. Increased skills of rural women could be helpful for development of income generating activities. Women from villages will be intensively and creatively involved in ecological education of the school children. Increased knowledge of women will allow them to participate in decision making at all levels, starting from the family level up to the high level. Linking individual skills building with networking and bringing groups into local partnerships strengthens the organisational capacity building. Capacity building and organisational development are ongoing processes. Organisational development and capacity-building are the part of the regular dialogue between the partner organisations.